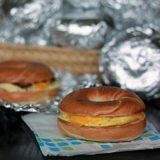 These bagel breakfast sandwiches stay in the freezer, just waiting to become a hearty breakfast on those busy mornings when you hardly have time to think, let alone get in a solid breakfast before you head out the door. Just grab one out of the freezer and go. They're perfect for mixed-diet households, too - just leave the meat off of the vegetarian sandwiches. I know I tend to talk a lot about babies and sleep, but seriously, man! Babies and sleep! I swear, every other day our darling daughter pulls another trick out of her hat that’s single-handedly designed to give us an entirely new level of appreciation for the book “Go the F— to Sleep.” That book, by the way, was of our more hilarious shower gifts. It was given to us by some sweetly smiling, knowing parents who surely knew exactly what we were in for and who quietly chuckled at our glowing pre-baby naivete. I’m not complaining; it’s never really complaining. I wouldn’t trade this for the world. It’s just … a whole new world. One in which we are learning that apparently you have to teach tiny people how to go to sleep on their own. So far we don’t seem to be the greatest teachers, but I’d like to think we make up for it in love. And patience. One of the many things we’ve tried over these past few months is moving our little one’s bedtime to earlier in the evening. It helped, but it also meant that my guy hardly got to see his little gal before we started up with bath, books, and lullabies. So he started going to work earlier, so that he can get home earlier, so he can spend more time with our sweetie who now goes to bed earlier. Which means that he has to get up really, really, really early. Which means there’s no time for breakfast. 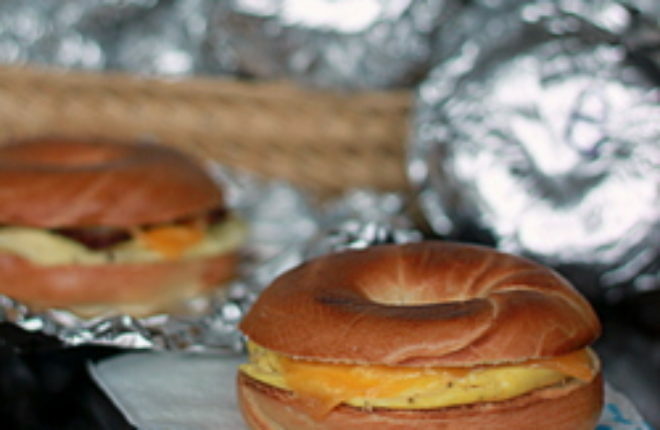 And that’s how we started up with these, the point of this whole scintillating sob story: Grab & Go Bagel Breakfast Sandwiches. I know, I know. It’s not like we’re going to win any awards for ingenuity or anything here. But I still wanted to share, because dang, these things really are a great way to get a rib-sticking, hearty breakfast down the hatch with no effort at all when it’s 5:30 in the morning and you’re in a mad scramble for the door. 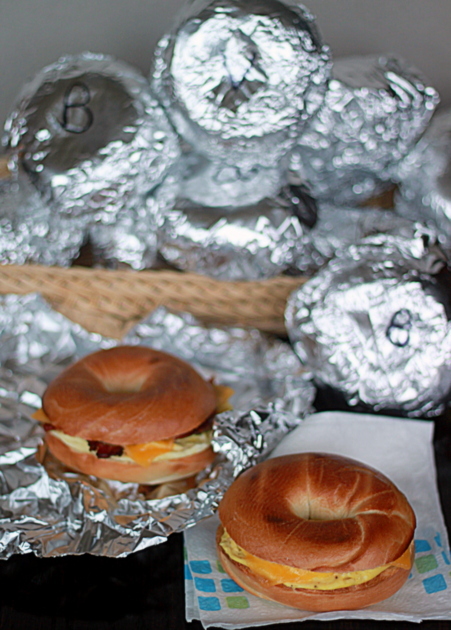 My bagel breakfast sandwiches consist simply of egg and cheese; his have bacon too. Or mine can have veggie sausage and his can have sausage sausage. We make up a mad pile of them, a dozen or more at a time. We wrap them all in foil, label them, and stick them in a gallon-sized freezer bag for easy storage. It’s basically the only way my guy is going to get bacon on weekday mornings, so he’s totally down with this whole grab & go plan. Toast the bagel in the toaster and set aside. 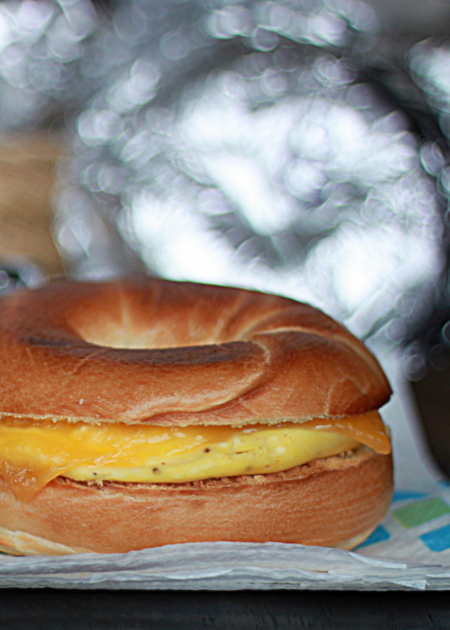 Crack the egg into a microwave-safe bowl that's roughly the same diameter of your bagel. Add the salt and pepper. Whisk until beaten well. Place in the microwave and cook on high for 60 seconds or until the egg is cooked through. With a spoon, loosen the egg and place it on one half of the bagel. Top with bacon, if using, and cheese. 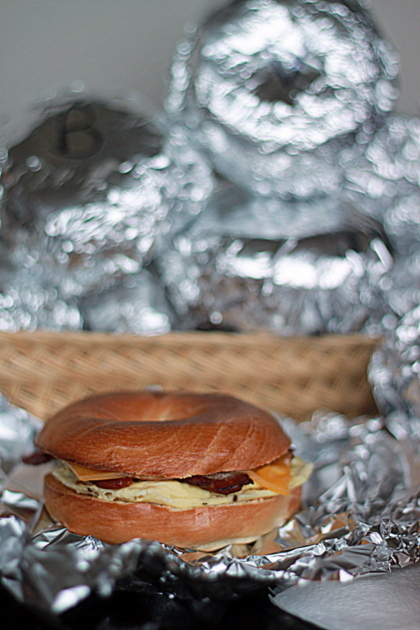 Top the bagel with the other half and place in a square of foil. Wrap well, label with a permanent marker, and place in a freezer storage bag. They should keep well for a at least a couple of months. To heat and eat, remove sandwich from freezer and unwrap. Wrap a paper towel around the sandwich and microwave for about 45 seconds on high. Turn over and microwave for another 15 seconds until heated through. Microwave ovens vary, so yours may take less (or more) time. Be careful not to overcook. Ah, these are round with a hole in them, pumpkins are round with holes in them after you carve them. So – Halloween-ish. You did a good job on little sleep. This is not food related but ‘baby’ related. I found that my three children and many others over the years liked to sleep on my chest. Pick a comfortable chair, put your feet up an pull a blanket over both of you. You will both get some sleep and you will not drop her. I promise. You may just nap or you might sleep the night through. I just thought you might like to try it. PS – I have used this with about 4 dozen babies over the years. (My Mom ran an infant day-care) and I haven’t dropped one yet. I LOVE bagels for breakfast, and experimenting with different bagel recipes. Looks great! Thanks for the recipe! I realize that this is coming a few years after you shared. My family purposefully doesn’t own a microwave, so I was wondering how to reheat these in a conventional oven. Thanks! I’d wrap them in foil and give them about 15 minutes at 350 or so? But I haven’t tried it myself so it might take a bit of trial and error. We are thinking of going microwave-less too, incidentally! I first want to say thank you so much for this awesome recipe! My family loves them! About the reheating…..if you freeze them…..let them thaw for a few minutes before you microwave for no more than 45 seconds. Otherwise, just put them inthe fridge and heat up for just a few seconds.